With only a couple days left until Halloween, I thought I should post these adorable little ghost meringues. Stop right there! Wait just a minute! I know it's practically second nature to turn and run in the opposite direction when you see the word "meringue" in a recipe. In fact, after my first attempt at a meringue ended in disaster I avoided them like the plague for years! However, after researching the matter and learning more about them, meringues are now one of my favorite things to make. Meringues are funny little creatures. Give them what they want and they grow quickly and stand up tall, but give them something different and they roll over and play dead. Here are a few tips to help you get started. Don't double the recipes! Really. It throws off the chemical reactions and doesn't work. If you need more than the recipe makes, make it in two (or more) batches. In a large mixing bowl or a stand mixer, begin to whip eggs whites at medium speed. When eggs start to look frothy, add the cream of tartar. 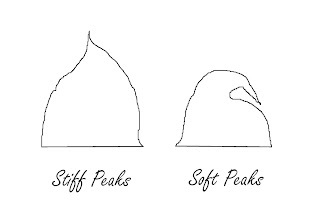 Continue mixing, increasing the speed to high until the whites have increased in volume and form stiff peaks. 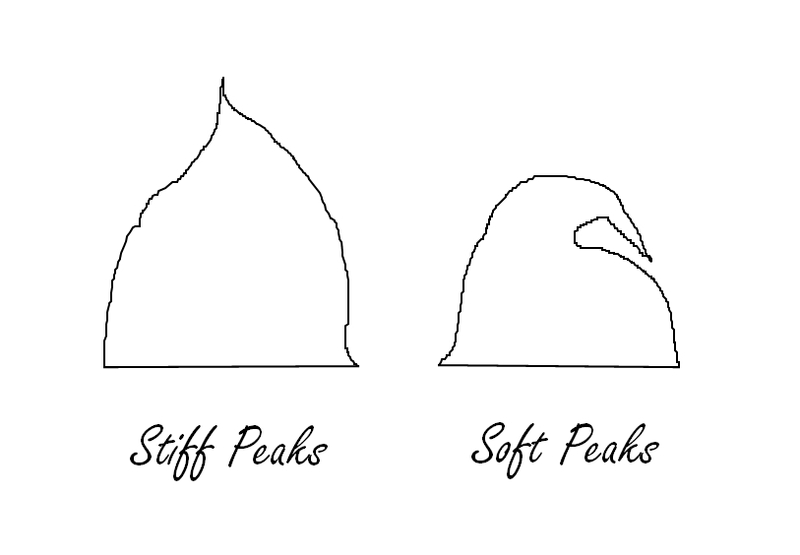 (Check out my awesome illustration of stiff and soft peaks at the bottom of the post!) Add the salt and continue mixing. Gradually add the sugar, a few tablespoons at a time. You may have to stop mixing to scrape down the sides once all the sugar is added. The meringue will become very stiff and glossy. Once all of the sugar has been added, rub a small amount of the meringue between your thumb and finger. If it feels gritty, keep mixing. When all of the sugar has dissolved and the meringue is completely smooth, it's ready to use. For the Face: The ghosts can be enjoyed as is, or you can decorate them with cute little faces. If you choose to do this, just melt some chocolate chips (you only need about 1/2 cup) and put them in a pastry bag with a very fine round tip or a plastic bag with a tiny hole cut into the corner. Carefully pipe little faces onto the ghosts. Allow the chocolate to dry at room temperature.